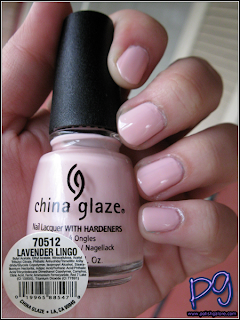 While on a small spree at Head2ToeBeauty, I finally decided to get China Glaze Lavender Lingo from the Patent Leather II collection, now discontinued. This is a creme, and was a bit streaky - it took 3 thick coats to get it opaque. I'm also pretty confused on the color - this doesn't look lavender to me. I'm sorry for the icky pictures - it's been pouring like mad here. This is the first time in three years that we haven't had a drought for the month of February, please bring on the sun! Now to the pictures! First up "sun" which is actually loads of clouds with rain. Then a few "shade" which was still just lots of clouds and rain. 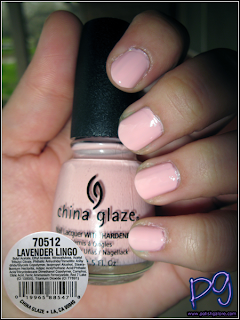 And finally one with a flash which was the most true to life color - this is such a pinkie color! This is very pretty!! But I agree - not lavender! More pinkie to me, with a hint of peach perhaps? Pretty nonetheless! I don't think the person who made this knows the true colour of lavender, because this is not that colour at all! It is a peachy-pink to me! This is a nice pink. This is very pretty but not even close to a lavender. That's why I have a hard time ordering polish online. I really need to see them in person (or wonderful bloggers great swatches!) since names can be so misleading.